Is it time for your home or office Building Envelope Inspection? We’ll find the Cause & Origin of strange odors, wet, or damp areas of your home or office and return your home or office to a healthy indoor environment Today! Conducting an Indoor Environmental Assessment and Building Envelope Inspections in Central Florida differs from many other areas across the Country. We have different construction methods than those applied in the north or even the mid west. The changes are reflected in the building envelope and the way in which we address the thermal dynamics of our region. A building envelope is the separation between the interior and the exterior environments of a building. It serves as the outer shell to protect the indoor environment as well as to facilitate its climate control. Building envelope design is a specialized area of architectural and engineering practice that draws from all areas of building science and indoor climate control. Control of air includes air movement through the components of the building envelope (interstitial) itself, as well as into and out of the interior space which affects building insulation greatly. Common measures of the effectiveness of a building envelope include physical protection from weather and climate (comfort), indoor air quality (hygiene and public health), durability and energy efficiency. In order to achieve these objectives, all building enclosure systems must include a solid structure, a drainage plane, an air barrier, a thermal barrier, and may include a vapor barrier. Moisture control is essential in Florida's hot and humid climate especially during the “dog” days of summer when it rains every afternoon. The Florida summer can really test a building's envelope. When we conduct a building envelope inspection we often find wall design errors which inadvertently create “double vapor barriers” by their assembly of non-permeable materials. This condition may interrupt the natural drying process of a home or buildings walls creating a significant accumulation of moisture and biological growth. The Cause and Origin of many Indoor Air Quality issues begins with a Building Envelope. Building envelope problems are some of the most common building problems encountered. Yet, they are still some of the least understood and can be some of the hardest to properly diagnose and correct. Until you can correctly and conclusively identify the Cause and Origin of your Indoor Air Quality problem and take the necessary corrective action, the Indoor Air Quality problem will remain. Until you can correctly and conclusively identify the Cause and Origin of your Indoor Air Quality problem and take the necessary corrective action the Indoor Air Quality problem will remain. The building envelope will protect you from the exterior elements and will allow you to maintain a comfortable and healthy indoor environment. If the building envelope fails you can and will have substantial indoor environmental issues when the exterior elements enter the building. The building envelope is what separates the inside of a building from the outside. A typical building envelope consists of the foundation, exterior walls, windows, doors, and the roof. This sounds simple enough…but because of the many complex products and systems involved, the building as a whole can become quite complicated and finding the specific cause and origin of a building envelope failure impossible for many. 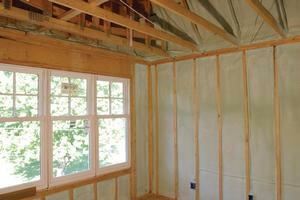 Spray foam insulation is an alternative to traditional building insulation such as fiberglass. A two-component mixture composed of isocyanate and polyol resin comes together at the tip of a gun, and forms an expanding foam that is sprayed onto roof tiles, concrete slabs, into wall cavities, or through holes drilled in into a cavity of a finished wall. Various systems are used to apply the spray foam. 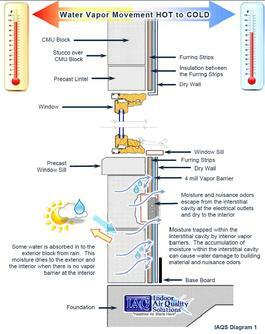 The two component high pressure system is generally used in new home construction. 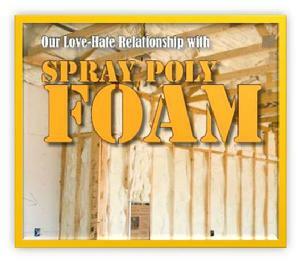 It is a quick expanding type of spray foam. The two component low pressure spray foam is another system that is used primarily for remodel jobs where there are existing walls with drywall already in place. This is also known as a slow rise formula and often referred to as injection foam. R-value is the term given to thermal resistance to heat flow. The higher the R-value of an insulation product, the more effective the insulation properties. 1.8-2 pound polyurethane foam has the highest R-value of readily available insulation used in homes and buildings. Polyurethane is a closed-cell or open-cell foam insulation material that contains a low-conductivity gas in its cells. As a result of the high thermal resistance of the gas, spray polyurethane insulation typically has an R-value around R-5 to R-6 per inch. In comparison, blown fiberglass typically has an R-Value of only R-2 to R-4 per inch. Foam insulation blocks all three forms of heat transfer. The flow of thermal energy through a substance from a higher to a lower temperature region. Foam thermoset plastics block conductive heat transfer due in part to having very loose molecular bonds; In addition the cells of the installed spray foam are either filled with air in the case of open cell foam or 245fa in closed cell foam. The process by which heat energy in the form of light (usually IR unless the substrate is hot enough to glow in the visible range) is emitted more strongly by warm surfaces and absorbed by other materials especially those of low IR reflectivity (think matte black finish). Radiant heat transfer does not require a medium. Thermoset foams, such as spray foam insulation, have the ability to reflect radiant heat. This is due to the reflective (shiny, in terms of IR) surfaces within the cell structure of the foam. When the building envelope is damaged, compromised, or was built wrong to begin with, then issues begin to appear. The problems listed below, and many other problems, can be attributed to building envelope problem. Have you seen any of these issues in your building? While some building envelope problems are easy to identify, others make it difficult to accurately find the root cause. They often camouflage themselves as another issue; making detection and correction of the real problem a challenge. Not only can these issues “hide in plain sight” but many moisture related problems happen in hidden areas and are not discovered until a substantial amount of damage has been done. To identify the not-so-obvious symptoms, particularly if the interior signs have not occurred or been identified, is when an inspectors’ knowledge and experience comes into play. It’s equally important that the inspector have a thorough knowledge of inspection methods and assessment protocols. Our Stucco Inspections look closely at the water management design and stucco assessor installation to ensure that the water that does make its way behind the stucco penetrates no further than the water barrier and then down and out the stucco mud-wall and termination weep screeds. Other problems can arise if the manufacturer's instructions are not adhered to during the installation process. One of the common problems are wide spread cracking in the surface due to improper stucco mix or ratios were not precise when mixing the material. Too much or too little of one of the three main components can result in the mixture being too dry and porous or too wet which leads to shrinkage and cracking as the material dries. any penetrations through the stucco system. Once the Exterior Visual Inspection is complete we can perform Infrared Thermal Imaging to identify any areas of thermal anomalies or temperature differential. The anomalies are then checked by Moisture Scanning to determine if the temperature anomalies are due to moisture. 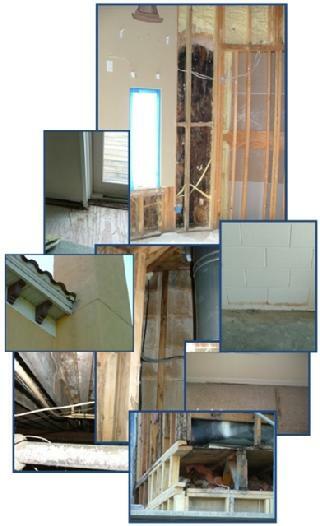 Not all moisture related issues are caused by moisture entering the building from the exterior. What do you do when the moisture issue is created inside your building? Or when both interior and exterior factors are contributing to a moisture issue? Many factors can influence how moisture moves into and out of commercial buildings. These factors include, building usage, zones, stack effect, wind, pressure differentials, and interior and exterior claddings; all of which make commercial buildings more complicated and therefore more difficult to properly diagnose than residential property. Additional factors contributing to moisture entering the building from the exterior include building age and construction, poor building practices, improperly installed components, shoddy repairs, deferred maintenance, and environmental factors. 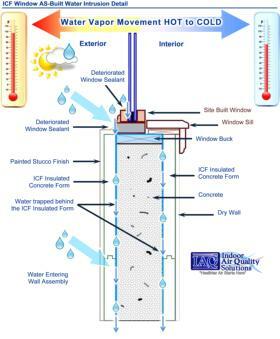 Combine all these considerations with internal issues such as ground water, condensation, humidity levels, air pressure differentials, and building functions; all of which contribute to moisture inside the building envelope. That makes for many, many ways for air and moisture to interact with the building and its components. IAQ Solutions provides several methods of investigation and assessment are available depending on the type of problem you are experiencing. An investigation begins by obtaining information as much information as possible about the building and the issue. Information can come from the building owner, maintenance people, employees, as well as contractors who have worked on the issue. Building plans, drawings, maintenance details, and other documentation are also used. By obtaining as much information as possible about the building and the issue we are better able to address your needs and help you resolve the problem. Visual Inspection – This is an on-site inspection of the building to assess building conditions. Oftentimes a visual inspection is performed in combination with some form of non-invasive testing. Depending on the nature or complexity of the issue, the findings of this inspection can be used to create a detailed plan of action to diagnose and determine causes. Non-Invasive Testing – This testing is used to support the findings of the visual inspection. 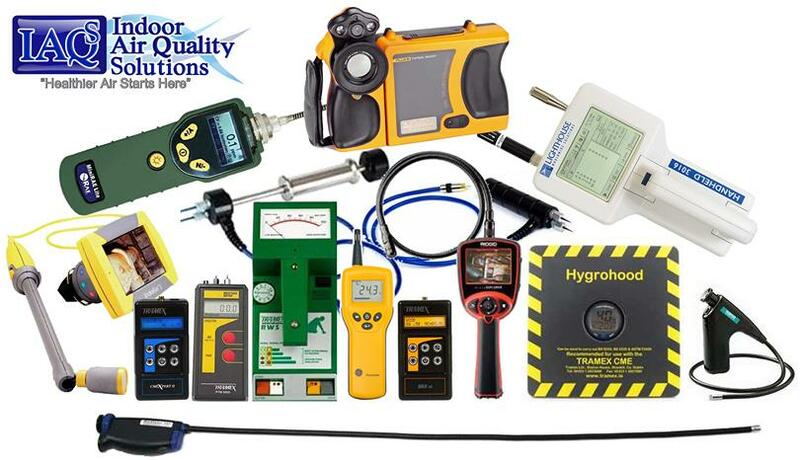 Electronic moisture detection equipment, moisture measurement tools, permeability testing, borescope cameras, hygrometers, plus other equipment and test methods can be used to assess the building. Invasive Testing & Analysis – Invasive testing is used to verify findings, determine if proper components were used in construction, verify if proper installation or repair techniques were followed, and to define the extent of a problem. Examples of invasive testing include the removal of various materials and claddings, sealant testing, and water testing.